The time had come for The Big Departmental Website Redesign, and my content strategist heart was all aflutter. Since I work at a research university, the scope wasn’t just the department’s site—there were also 20 microsites focusing on specific faculty projects. Each one got an audit, an inventory, and a new strategy proposal. I met one-on-one with each faculty member to go over the plans, and they loved them. Specific strategy related to their users and their work! Streamlined and clarified content to help people do what needed doing! “Somebody pinch me,” I enthused after another successful and energizing meeting. Don’t worry, the pinch came. I waltzed into my next microsite meeting, proud of my work and capabilities. I outlined my grand plan to this professor, but instead of meeting with the enthusiasm I expected, I was promptly received a brick wall of “not interested.” She dismissed my big strategy with frowns and flat refusals without elaboration. Not to be deterred, I took a more specific tack, pointing out that the photos on the site felt disconnected from the research. No dice: she insisted that the photos not only needed to stay, but were critical to understanding the heart of the research itself. She shot down idea after idea, all the while maintaining that the site should both be better but not change. My frustration mounted, and I finally pulled my papers together and asked, “Do you really even need a website? !” Of course, she scoffed. Meeting over. Struggles with subject-matter experts (SMEs) are as diverse as the subject-matter experts themselves. Whether they’re surgeons, C-level executives, engineers, policy makers, faculty—we as web workers need SMEs for their specialized content knowledge. Arming yourself with the right tools, skills, and mentalities will make your work and projects run smoother for everyone on your team—SME included. Know that nobody comes to the table with a clean slate. While the particulars may be new—a web presence, a social media campaign, a new database-driven tool—projects aren’t. When starting off a project, I’ll ask each person why they’re at the table. Even though it may be obvious why the SME is on the team, each person gets equal time (no more than a minute or two) to state how what they do relates to the project or outcome. You’re all qualified to be there, and stating those qualifications not only builds familiarity, but provides everyone with a picture of the team as a whole. I see SMEs as colleagues and co-collaborators, no matter what they may think of me and my lack of similar specialized knowledge. I don’t come to them from a service mentality—that they give me their great ideas and I humbly craft them to be web-ready. We’re working together to create something that can serve and help the user. After my disastrous initial meeting with the prickly professor, I gave myself some time to calm down, and scheduled another meeting with one thing on my agenda: listening. I knew I was missing part of the story, and when we sat down again, I told the SME that I only wanted her to talk to me about the site, the content, and the research. I wasn’t satisfied with her initial surface-level responses, because they weren’t solvable problems. To find the deeper root causes of her reluctance, I busted out my friends the Five Ws (and that tagalong how). When she insisted something couldn’t be removed or changed, I breezed right past why, because it wasn’t getting me anywhere. Instead, I asked: when did you choose this image? Where did this image come from? If it’s so essential to the site, it must have a history. I kept asking questions until I understood the context that existed already around this site. Once I understood the context, I could identify the need that content served, and could make sure that need was addressed, rather than just cutting it out. Through this deeper line of questioning, I learned that the SME had been through an earlier redesign process with a different web team. They started off much in the same way I had—with big plans for her content, and not a lot of time for her. The design elements and photos that she was determined to hang on to? That was all that she had been able to control in the process before. By swooping in with my ideas, I was just another Web Person to her, with mistrust feeding off old—but still very real—feelings of being ignored and passed over. It was my responsibility to build the working relationship back up and make it productive. In the end, the SME and I agreed to start off with only a few changes—moving to a 960-pixel width and removing dead links—and left the rest of the content and structure as-is in the migration. This helped build her trust that I would not only listen to her, but be a good steward of her content. When we revisited the content later on, she was much more receptive to all my big ideas. Listening is a key skill here: let them be heard, and try to uncover what’s at the root of their resistance. Some people may have a natural affinity for these people skills, but anyone will benefit from spending time practicing and working on them. Sometimes you and your SME are on the same page, ready to hop right in to Shiny New Project World! And hey, they have a great idea of what that new project is, and it is totally a Facebook page. Or a Twitter feed. Or an Instagram account, even though there is nothing to take photographs of. This doesn’t necessarily indicate a mentality of “Social media, how hard can it be!”–instead, exuberance signals your SME’s desire to be involved in the work. In the case of social media like Facebook or Twitter, the SME knows there is a conversation, a connection, happening somewhere, and they want to be a part of it. They may latch onto the thing they’ve heard of—maybe they check out photos of their friend’s kids on Facebook, or saw the use of hashtags mentioned during a big event like the World Cup. They’re not picking a specific tool just to be stubborn—they often just don’t have a clue as to how many options they actually have. 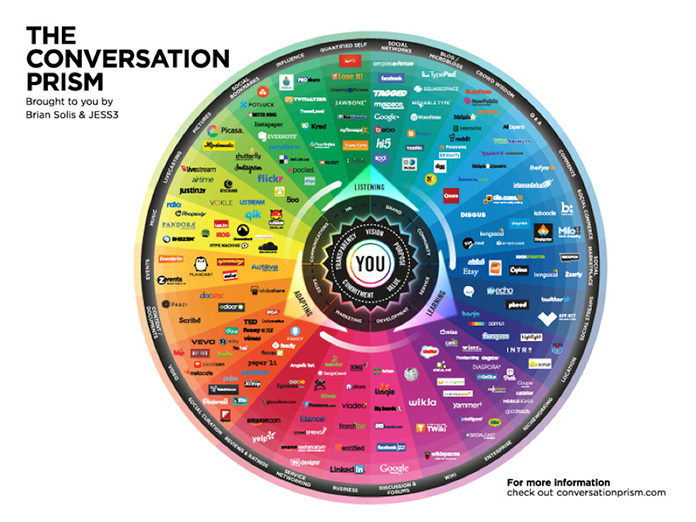 The Conversation Prism, a visual map of social media. Click to view larger. Each wedge of this photo is a different type of service, and inside the wedge are the sites or tools or apps that offer that service. This is a great way to show the SME the large toolbox at our disposal, and the need to be mindful and strategic in our selection. Who is this project/site/page for? Who is this project/site/page not for? Oftentimes, this is the first time the SME has really thought about audience. If the answer to Question 1 is “everyone,” I start to ask about specific stakeholder groups: Customers? Instructors? Board Members? Legislators? Volunteers? As soon as we can get one group in the “not for” column, the conversation moves forward more easily. An SME who says a website is “for everyone” is not coming from a place of laziness or obstinacy; the SMEs I work with simply want their website to be the most helpful to the most people. What other sites out there are like, or related to, the one we hope to make? SMEs know who their peers, their competitors, and their colleagues are. While you may toil for hours, days, or weeks looking at material you think is comparable, your SME will be able to rattle off people or projects for you to check out in the blink of an eye. Their expertise saves you time. There are obviously a lot more questions that get asked about a project, but these two are a great start to collaborative work, and function independently of specific tools. They facilitate an ongoing discussion about the Five Ws, and lay a good foundation to think about the practical side of the how. It is possible to have a great working relationship with an SME. The place to start is with people—meet your SME, and introduce yourself! Meet as soon as the project starts, or even earlier. If you work with a large group of SMEs, find out where and when they gather (board meetings, staff retreats, weekly team check-ins) and get on the agenda. I managed to grab five minutes of a faculty meeting and told everyone who I was, a very basic overview of what I did, and that I was looking forward to working together—which sped up putting faces to names. If you’re having trouble locating the SMEs—either because they’re phenomenally busy or reluctant to work together—try tracking down an assistant. These assistants might have access to some of the same specialized knowledge as your SME (in the case of a research assistant), or they could have more access to your SME themselves (in the case of an executive assistant or other calendar-wrangler). Assistants are phenomenal people to know and respect in either of these cases; build a good, trusting relationship with them, and projects will move forward without having to wait for one person’s calendar to clear. Similarly, making yourself easier to find can open doors. I told people it was fine to “drop by any time,” and, while true, actually left people with no sense of my availability. When I started establishing set “office hours” instead, I found that drop-in meetings happened more often and more predictably. People knew that from 9 to 11 on Tuesdays and Thursdays, I was happy to talk about any random thing on their mind. I ended up having more impromptu meetings that led to better work. SMEs, as stated in their very name, have specialized knowledge I don’t. However, the flip side is also true: my specialized knowledge is something they need so their content can be useful and usable on the web. Though you and your SMEs may be coming from different places, with different approaches to your work, and different skill sets and knowledge, you’ve got to work together to advance the project. Do the hard work to understand each other, and move forward even if the steps seem tiny (don’t let perfect be the enemy of the good!). Find a seed of respect for each other’s knowledge, nurture it as it grows, and bask in the fruits of your labor—together. Amanda Costello is the lead content strategist in the University of Minnesota’s College of Education and Human Development (CEHD), and the director of MinneWebCon, a grassroots knowledge-sharing web conference in Minnesota. She enjoys filling out forms because it feels like taking a test where she knows all the answers. Find her on Twitter @amandaesque. Thank you Amanda, an interesting article. As a web developer it is always difficult to keep up with the latest technologies, however, in this article you talk about skills such as communication that are just as valuable and that have obviously been around a lot longer. I find discussing web strategy with a SME very challenging. The tendency is for the conversation to become about how the website should look and what content goes where. However, from this article I have learned that these topics should come much later in the process. Next time I have a conversation with an SME I will ensure I take the time to find out more about their area and tap into some of that knowledge. At times I realise that I might make them uneasy when talking immediately about web strategies and concepts that might make take them outside of their comfort zone. In the ideal scenario where there is humility and respect for people we work with, we would all feel like we can add value and that surely would make for a more productive meeting. Ok I think you got your terms confused. The professor is THE key stakeholder. The Fact she is the SME for her field of study is secondary. You are the SME in web development and you should understand she is the web site owner. Basically you are working for her so treat her with respect and try not to force your ideas and concepts during the initial meeting. If you had approached her by asking 4 basic questions (below). And if you had let her dictate the direction of the conversation. You might have gotten a very different result. I use these simple questions and listen and take notes. Expand on the topics with follow-up questions. Understanding her point of view is critical to the redesign process. 1. What do you like about the current website (include process)? 2. What don’t you like about the current website (include process)? 3. What is your wish-list for the new web site? 4. What do you need from the new site? Paolo, you hit the nail on the head. I don’t even bring a laptop or tablet to the first meeting or two that I have with an SME. We don’t look at designs or layouts or anything. We talk about target audience, we talk about goals — not web site goals, but goals outside the web site that the site could help to achieve. It’s amazing how, as Amanda said, *listening* to people about their needs and fears helps to make a better project all around. Dave, I have to disagree with one of your comments. The professor is not the key stakeholder. The user of that web site (often a student, researcher, or grant funding agency) is the key stakeholder. We don’t build web sites for professors, we build web sites about professors and their work so that people other than the professor can learn, read, understand, and act. As I often tell my SME colleagues, “You are not your target audience.” As a web SME, I have a much better understanding of their target audience than they do — or I have the tools at my disposal to figure them out, if I don’t know already. This is, of course, somewhat different in industry — where one has paying customers, no governing body that may have complementary or competing interests, no “part of a monolithic whole” where everyone has to fit in, but everyone also is a unique snowflake. But higher ed is a different world. We’re not trying to convert visitors into customers (except in an admission sense, of course). What you explain is a service-bureau model (which many schools still have! ), involving a low-level web designer or developer listening to what the SME wants, and then doing it. A (superstar) content strategist such as Amanda is, you’re right, an SME, but she’s not an SME in just web development, she’s the SME in how to identify, and then best serve the users of the *university’s* web site. She’s an SME in web content, in converting a narrative into a web site using words, art, layout, color, typography, and overall architecture to convert the original SME’s information and goals into something more than a brochure she could have written herself. Kerri you are confusing Key Stakeholder with Target Audience. As someone who’s wetting their feet into whole web development and promotions thing, your article is a great help for me to understand further what I can do for our site. It’s hard to keep up with the rapid changes but we will get by. Thanks for writing this from an in-house perspective. I was in-house for many years and was frustrated by the dearth of articles discussing these dynamics. Thank for very interesting article. You think and you done it. You are right. A site developing is very difficult and more difficult is unique content writing. Than target set up. Than optimization to bring visitors on site. You choose specialists and follow their instructions. Now you succeeded. Sounds like your two meetings occurred in reverse order. The first should be listening and the second meeting is the one where you present your ideas. It’s a good reminder that we must listen first before we expect to accomplish anything. Great article, Amanda! Listening is the first and most important step with SMEs – I could not agree more. Taking the time to draw out why people are being difficult is also so important. Like you said, everyone brings baggage to the table, and it takes time to build trust and break down old walls. I often think to myself that I’m not really running web redesign projects so much as I’m running cultural change management projects where the web redesign represents the primary shift in thinking and behavior. So many projects live and die based on the human relationships that are tended or neglected throughout. Brilliant strategy and breathtaking design will never overcome mistrust, doubt, fear and bitterness on their own. Groundbreaking technology will never solve people problems. Healthy human relationships are the foundation for success on all fronts, and the foundation to healthy relationships is the ability to listen well!